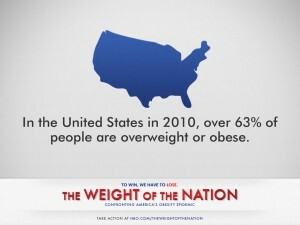 Obesity is a serious, chronic disease that can negatively effect the health of any number of systems in your body. People who are overweight or obese have a much greater risk of developing everything from heart disease and Type 2 diabetes to bone and joint disease. The U.S. Surgeon General has declared that overweight and obesity have reached epidemic proportions in the United States. Currently, about 35 percent of women and 31 percent of men are considered significantly overweight, and 30 percent of children between the ages of six and 19 are significantly overweight. Public health officials say the results of physical inactivity and poor diet are catching up to tobacco as a significant threat to health. Additional fat tissue in the body needs oxygen and nutrients in order to live, which requires the blood vessels to circulate more blood to the fat tissue. This increases the workload of the heart because it must pump more blood through additional blood vessels. More circulating blood also means more pressure on the artery walls. Higher pressure on the artery walls increases the blood pressure. In addition, extra weight can raise the heart rate and reduce the body’s ability to transport blood through the vessels. Obesity is the major cause of type 2 diabetes. This type of diabetes usually begins in adulthood but, is now actually occurring in children. Obesity can cause resistance to insulin, the hormone that regulates blood sugar. When obesity causes insulin resistance, the blood sugar becomes elevated. Even moderate obesity dramatically increases the risk of diabetes. For more information click onto the following Diabetes Public Health Resource by the CDC. Atherosclerosis (hardening of the arteries) is present 10 times more often in obese people compared to those who are not obese. Coronary artery disease is also more prevalent because fatty deposits build up in arteries that supply the heart. Narrowed arteries and reduced blood flow to the heart can cause chest pain (angina) or a heart attack. Blood clots can also form in narrowed arteries and cause a stroke. Obesity can affect the knees and hips because of the stress placed on the joints by extra weight. Joint replacement surgery, while commonly performed on damaged joints, may not be an advisable option for an obese person because the artificial joint has a higher risk of loosening and causing further damage. Sleep apnea, which causes people to stop breathing for brief periods, interrupts sleep throughout the night and causes sleepiness during the day. It also causes heavy snoring. Respiratory problems associated with obesity occur when added weight of the chest wall squeezes the lungs and causes restricted breathing. Sleep apnea is also associated with high blood pressure. In women, being overweight contributes to an increased risk for a variety of cancers including breast, colon, gallbladder, and uterus. Men who are overweight have a higher risk of colon and prostate cancers. The National Cholesterol Education Program has identified metabolic syndrome as a complex risk factor for cardiovascular disease. Metabolic syndrome consists of six major components: abdominal obesity, elevated blood cholesterol, elevated blood pressure, insulin resistance with or without glucose intolerance, elevation of certain blood components that indicate inflammation, and elevation of certain clotting factors in the blood. In the US, approximately one-third of overweight or obese persons exhibit metabolic syndrome. In a culture where often the ideal of physical attractiveness is to be overly thin, people who are overweight or obese frequently suffer disadvantages. Overweight and obese persons are often blamed for their condition and may be considered to be lazy or weak-willed. It is not uncommon for overweight or obese conditions to result in persons having lower incomes or having fewer or no romantic relationships. Disapproval of overweight persons expressed by some individuals may progress to bias, discrimination, and even torment. Today, children and adults experience a very different lifestyle. Walks to and from school have been replaced by car and bus rides. Gym class and after-school sports have been cut; afternoons are now spent with TV, video games, and the internet. Parents are busier than ever and families eat fewer home-cooked meals. Snacking between meals is now commonplace. Portions are now two to five times bigger than they were in years past. Beverage portions have grown as well- in the mid-1970s, the average sugar-sweetened beverage was 13.6 ounces compared to today, kids and adults think nothing of drinking 20 ounces of sugar-sweetened beverages at a time. Weight and height are used to calculate a number called the “body mass index” (BMI). For most people, BMI is a good estimate of body fatness. BMI does not measure body fat directly, but research has shown that BMI correlates to direct measures of body fat and is a quick an easy guide to assessing your own body weight. However, to determine if excess weight is a health risk, a healthcare provider would need to perform further assessments. These assessments might include skinfold thickness measurements, evaluations of diet, physical activity, family history, and other appropriate health screenings. Go the Harvard School of Public Health’s Obesity Prevention Source for an in-depth resource for all who seek to understand the causes of obesity—and to reverse the epidemic of obesity in children and adults.